There is no queue, only a ticket in a lottery, in the official refugee resettlement process. In most countries that refugees come from, like war zones, there is no way to apply for refugee status. The waiting time in the world’s refugee camps is so slow that at current rates it would take over 140 years to resettle everyone. Most are never resettled. People seeking asylum who come by boat are detained despite not having broken any law. Under Australian and international law it is completely legal to arrive here by boat and claim asylum. This is because these laws have always recognised that when people’s lives are at risk, they cannot wait to apply through whatever “proper procedures” there might be. When the Government labels asylum seekers “illegals” and puts them in detention centres it is deliberately trying to demonise people for its own political gain. Stopping the boats just means refugees die somewhere else. If the Government really cared about the lives of asylum seekers, it would give them an alternative to a boat journey by processing asylum seeker claims in Indonesia and flying to Australia those found to be refugees. But the government has now ended any resettlement of refugees from Indonesia—with over 10,000 currently stranded there. These people have nowhere else to go. Australia has only ever faced a small number of refugees arriving here. The highest number ever to arrive by boat in one year, 2013, was 20,587. That is just 10% of our overall annual immigration intake. In the same year the US took 88,400, France took 60,100, Germany 109,600 and Italy 27,800. Australia can do much better. About 90% of asylum seekers who come by boat are found to be refugees, according to the Government’s refugee claims assessments. Only the most desperate people are prepared to risk danger and death to travel here by boat. Don’t they use people smugglers? Refugees often have no choice but to use “people smugglers”. Many people smugglers have been considered heroes, like Oskar Schindler, who saved more than 1000 Jews during the Holocaust. But whatever the people smugglers’ motives, they are often the only way to escape repressive regimes and find safety. Why can’t they stay in Indonesia? Asylum seekers in Indonesia can live in destitution for a decade while waiting for help. They cannot access healthcare, cannot work and cannot send their kids to school. They are often harassed by police or thrown in detention. To be safe, asylum seekers need to get to a country that has signed the Refugee Convention and can grant them protection—like Australia. 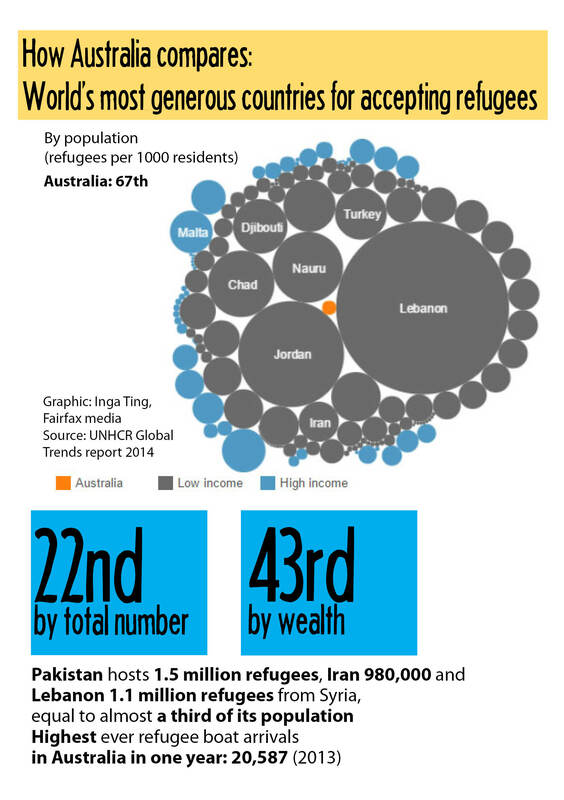 No refugee who arrived by boat has ever been involved in terrorism in Australia. Most terror attacks are carried out by people born and raised in the West. For instance all those who carried out the Paris attacks in November 2015 were European citizens. Many refugees, like those from Syria and Iraq, are actually fleeing terrorism in their home countries. Shouldn’t we look after homeless and poor Australians first? Australia is one of the wealthiest nations in the world. There is more than enough money here to provide proper jobs and services for everyone. It is government policies that favour the richest people while taking from the most vulnerable that mean some Australians go without. 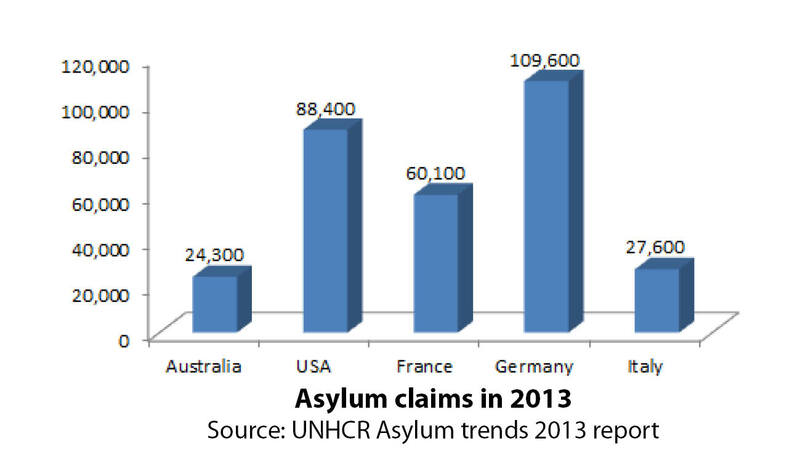 Detaining a single asylum seeker on Manus or Nauru costs $400,000 per year. It would be far cheaper to allow them to live in Australia. Prepared by Refugee Action Coalition. Download this fact sheet as a printable pdf here.